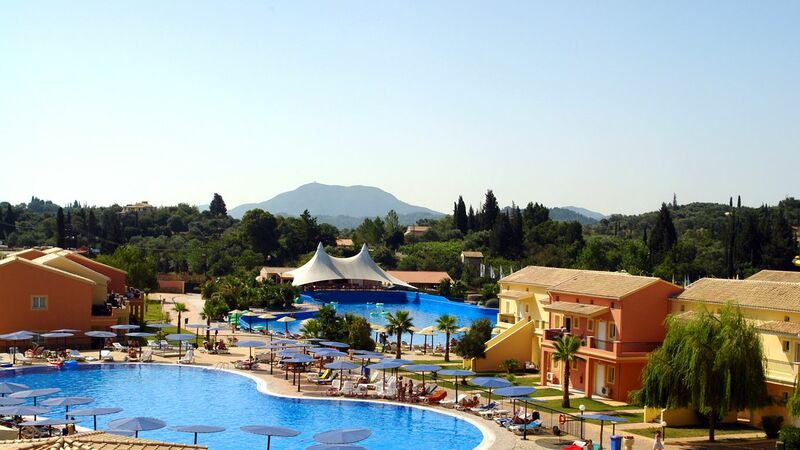 Aqualand Resort Corfu is the budget-friendly and high-energy family resort where kids are free to imagine, play slide and splash and join in poolside activities. Aqualand Resort Corfu is newly built and designed in the typical Corfiot style as a small village and adjacent to the famous Aqualand Waterpark, one of the amazing and adventurous water parks in Europe. In an area of 12.000 sqm, there are water rides and slides, rivers and pools with plenty of fun and excitment on over 15 different water-themed rides and attractions for all who want to have fun with their family. Relax with your little ones in one of the 158 rooms and apartments of Aqualand Resort, which are all including Air-condition, telephone, satellite-TV, mini-fridge, safe (with charge), microwave, kettle, bathroom with shower and either terrace or balcony and enjoy all the high standards of facilities and services of our all-inclusive package including restaurants, bars, swimming pools, tennis courts, play grounds, shuttle service to Glyfada Beach and Corfu Town and of course daily free entrance to the Aqualand Waterpark.